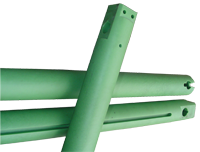 Redco™ Nylon MD-Oil filled is one of the most versatile standard grades of Redco™ Cast Nylon. Redco™ Nylon MD-Oil provides the same high Compressive Strength and Load Bearing properties of MD filled, with all the advantages of a Liquid Lubricant. Redco™ Nylon MD-Oil is especially suited for High Load – Low RPM applications, but is a superior replacement for MD in many heavy-duty friction generating applications. Pillow blocks, trunnion bearings, rope sheaves, pulleys, sprockets, slipper pads, dryer bushings.